FootJoy’s Custom MyJoys Program is celebrating 10 Years with the introduction of new Premium Italian Leathers. The company says the Premier category allows customers to design their shoes to include the finest Snake and Lizard print Italian leathers. Available in a bicycle toe pattern in cleated FJ ICON and FJ ICON Boa styles, as well as the spikeless FJ Professional, the Premier line offers black, brown and red snake prints in addition to pearl and charcoal lizard print leathers. 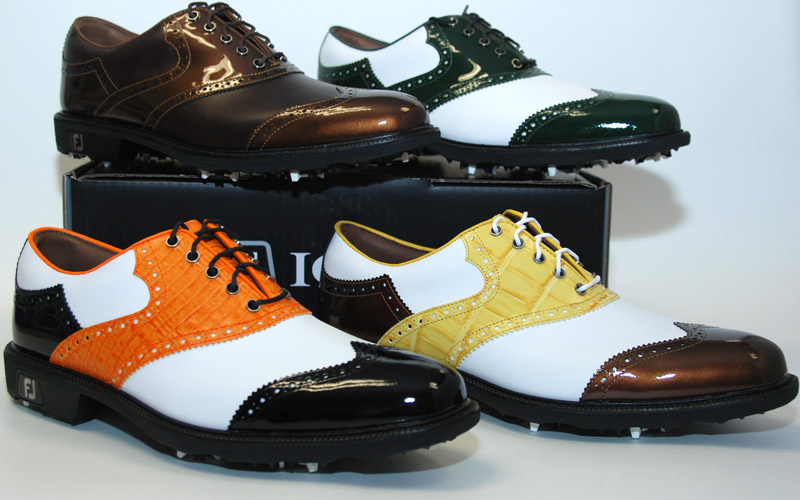 FootJoys says golfers can choose from 23 different upper patterns across cleated and spikeless outsoles on the largest size chart in golf. Sizes range from 4 extra narrow to 17 extra extra wide – which equates to 138 different size options. Consumers even have the opportunity to order different sizes for each foot, if necessary. MyJoys offers 21 smooth leathers in a variety of colors, three metallics, 20 limited edition animal prints (blue iguana, lilac lizard, banana croc, etc) and 10 patent leathers. In addition, golfers can personalize their MyJoys shoes and choose to add aname or message up to six characters in length and can select from a library of logos, including 114 novelty logos, 90 country flags, 45 collegiate logos and all 30 MLB logos. All personalization is embroidered on the shoe.